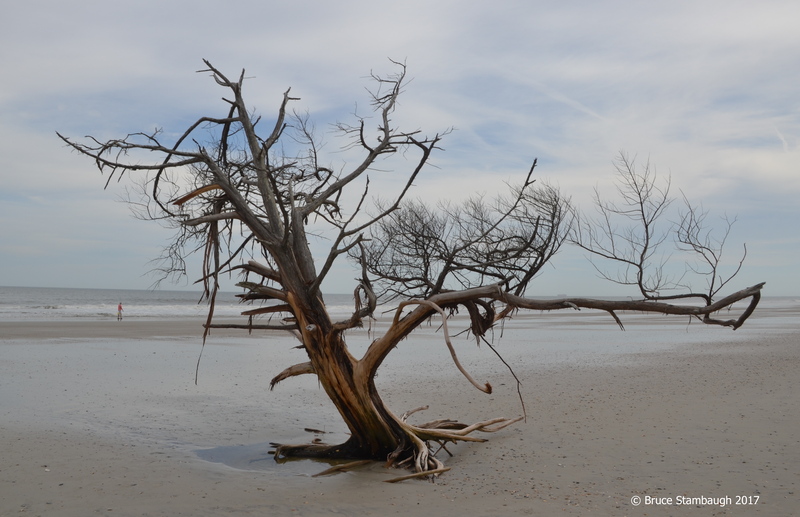 A straggly driftwood tree on a lonely beach might seem like a strange symbol with which to say “Happy Thanksgiving.” From my perspective, it’s just right. The stalwart tree, battered by wind and sea, still stands. To me, it serves as a reminder of all those in the world today who have so little, who daily strive to just find food, water, and shelter. Likely, we don’t have to really look too far to find folks who lack at least one of those most precious life necessities. It struck me that the tree dramatically overshadows the person walking the beach looking for seashells and sharks teeth. Of course, this is due to distance. That perspective, however, serves to highlight just how small we are in relationship to all of the world’s human problems. My point on this Thanksgiving Day in the United States is for all of us to be extra thankful for all that we have. It’s too easy to take for granted the gathering of friends and family around a bountiful table of your favorite Thanksgiving offerings. As we partake in the meal, let us remember in prayer and in decisive action those who have so little. “Standing Strong” is my Photo of the Week. Thank you, Gail and Don. Thank you so much, Roger. I loved your turkey shot by the way. Happy Thanksgiving to you & yours Bruce!!! “Bruce Stambaugh” wrote this piece, and I truly wish I wrote mine more eloquently as he. Every word is full of compassion. Please check out more of Bruce’s entries. His photography is truly beautiful. Thank you, Beckie, for your kind words and for reblogging the post. I’m glad you liked it enough to share the thanks with others. Thanks for reblogging this post. I greatly appreciate it. You’re so right and I feel blessed to have read this Thanksgiving post.